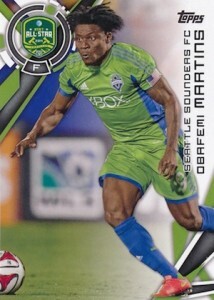 Base variations have carved out a regular spot in many products and 2015 Topps MLS Soccer is no different. 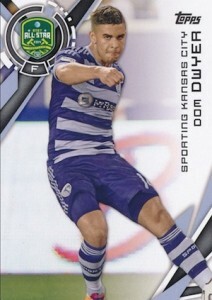 Continuing the trend that has been featured in each Topps MLS product since they acquired the MLS license in 2013, there are a total of 10 short-printed variations. 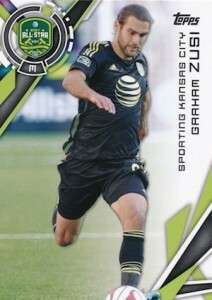 Although many variations simply substitute the main image with a subtly-different shot of the player, 2015 Topps MLS builds on the 2014 release with an All-Star theme for ten of the top MLS players. 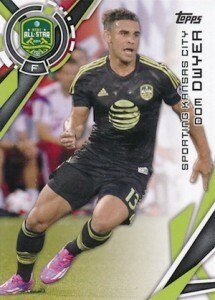 The variation images all come from the 2014 All-Star match that pitted the best MLS players against FC Bayern Munich. 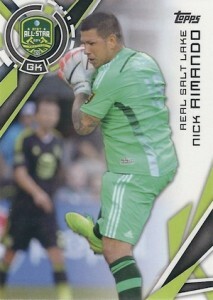 This makes the variations much easier to spot and is also a nice reminder for MLS fans as the All-Star squad took down the German soccer powerhouse 2-1. 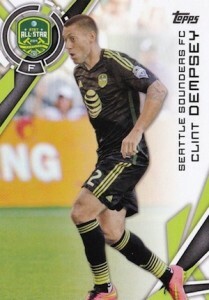 The 2015 Topps MLS variations checklist features some of the biggest names in the MLS and several of the top players from the U.S. Men's National Team, including Clint Dempsey and Michael Bradley. 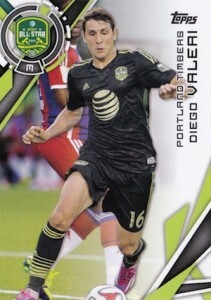 Since the variations cover players found in the 21-card All-Star subset, both versions of the cards for the ten players feature the 2014 MLS All-Star logo in the top-left corner. At 1:34 packs, the cards are limited, but not impossible to pull and fall, on average, in every other box. 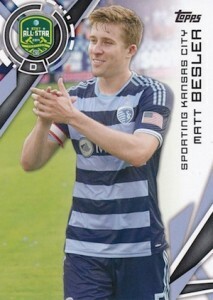 The guide below includes the base and variation cards for each player to offer a convenient side-by-side comparison. 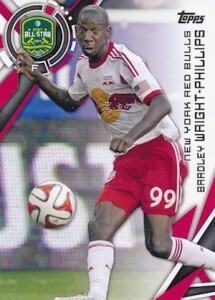 And don't worry when you see the cards for Bradley Wright-Phillips. He frequently makes that facial expression. Click on the listings or images below to shop for specific variations on eBay. Is there any market for these in the US? 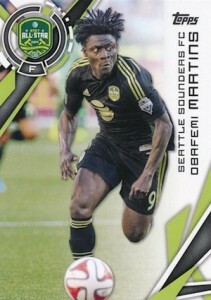 I have a bunch of great #d Panini 2014 World Cup cards and they seem to be worth nothing. 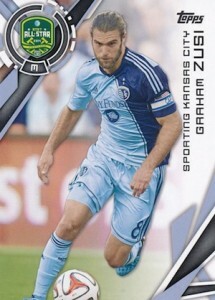 Can’t even get $10.00 for some Luis Suarez cards I have, both numbered inserts. 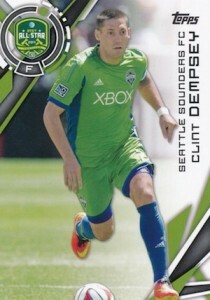 He’s about the 3-4 best player in the world…Is buying MLS cards a better investment as far as re-sale in the United States. 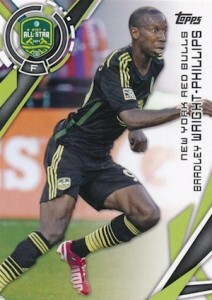 I want to get a box, keep the ones I want, put the rest on Ebay. 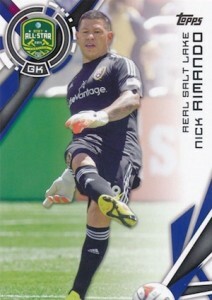 Anyone got any experience with selling the MLS cards on ebay? Mike H � MLS resale values are not great, even in the United States. 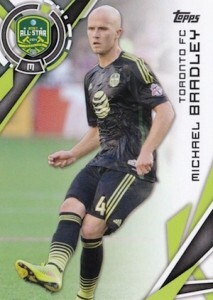 That could change if/when the new crop of MLS stars (Pirlo, Lampard, Gerrard, Kaka, etc.) 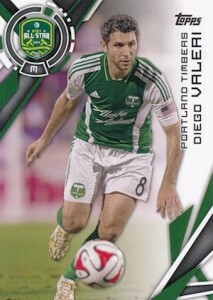 have autographs in products. So maybe in 2016?